Issue 6.1 is now online! Our first issue of 2015 is now online! We also have two wonderful Open Access papers, ‘Evaluation and management implications of uncertainty in a multispecies size-structured model of population and community responses to fishing‘ by Robert B. Thorpe, Will J. F. Le Quesne, Fay Luxford, Jeremy S. Collie and Simon Jennings and ‘Split diversity in constrained conservation prioritization using integer linear programming‘ by Olga Chernomor, Bui Quang Minh, Félix Forest, Steffen Klaere, Travis Ingram, Monika Henzinger and Arndt von Haeseler. 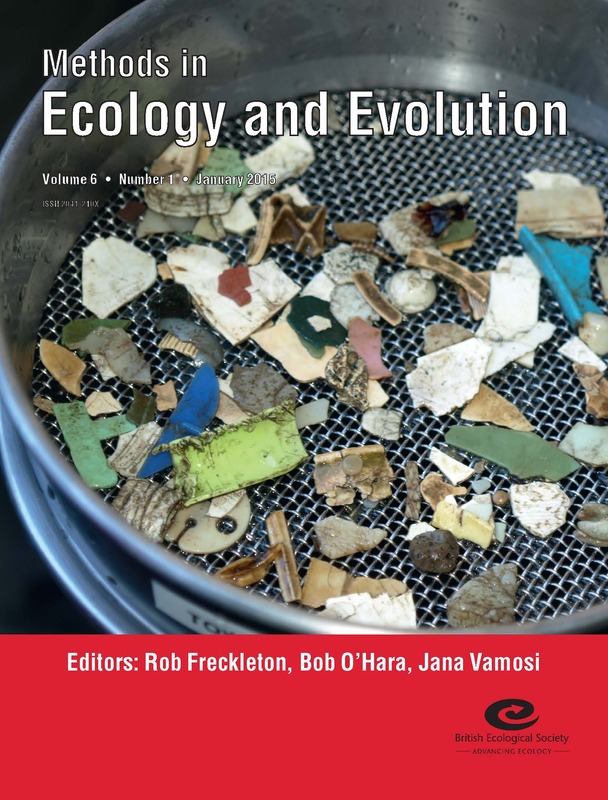 This month’s cover image shows more than 170 plastic pieces that were found in the digestive system of a single deceased seabird. Plastic items this seabird ate included industrial pellets (‘nurdles’) that are just a few millimeters long, drink bottle lids, ties used for helium balloons, a plastic doll’s arm and numerous other plastic pieces, some more than 55 mm in length. We can necropsy deceased birds to find out what they have eaten as they forage in the open ocean. However, to understand the pervasiveness of plastics in the marine environment and the potential impacts to wildlife, non-destructive sampling is key. There is a new method to assess the ubiquity of plastics ingestion in seabirds. A simple swabbing technique, coupled with gas-chromatography/mass spectrometry, can be used to identify phthalate plasticizers that have been adsorbed into the preening oil of seabirds.The approach is quick, simple and can be used on live, wild-caught individuals without harm, serving as an effective tool to help manage declining, threatened or endangered species. You can read more about this swabbing technique in Hardesty et al.’s ‘A biochemical approach for identifying plastics exposure in live wildlife‘, which is available free of charge. Photo © Britta Denise Hardesty, CSIRO. This entry was posted in Journal updates, Methods papers and tagged Application, conservation, Demography, Distributions, ecology, evolution, Issue 6.1, Measuring Diversity, methods, statistical methods by Chris Grieves. Bookmark the permalink.